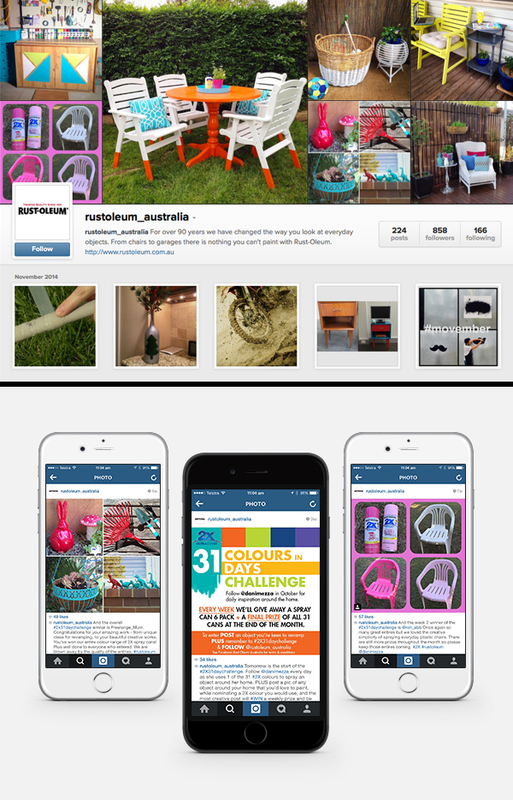 Splash launched the 2X 31 COLOURS IN 31 DAYS CHALLENGE, a social media campaign for our client Rust-Oleum that ran on Instagram and Facebook.. The idea centred around our partnership with one of Sydney’s leading lifestyle and renovation bloggers. Her task was to paint 1 object a day for 31 days in October in each of the 31 colours from the 2X Ultra Cover range. We would then encourage our followers to post their own painted objects. We gave away weekly and monthly prizes. The participation rate was fantastic and the results exceeded our expectations. In fact, our growth in followers was 35% over the month while the amount of likes and shares were phenomenal. What was most pleasing about this social media marketing campaign was the organic participation rates. This stemmed from our decision to use a game of skill, not game of chance, as an entry mechanic.